Last weekend the weather in Seattle was sunny with spring-like warmth. On those kind of days I love my back deck! With it’s southern and sunny exposure it’s the perfect place to sit outside and enjoy the day. Although the temperatures have dropped back into the winter zone this week, you know it won’t be long before we are enjoying more soft, spring days so get ready for your own impromptu Seattle picnic! I started the day on Saturday with a nice long walk along the downtown waterfront, through Pioneer Square and then back up to the Pike Place Market. On the way through the Market I picked up a dozen Hood Canal oysters from Pike Place Fish and a loaf of fresh bread from Le Panier. 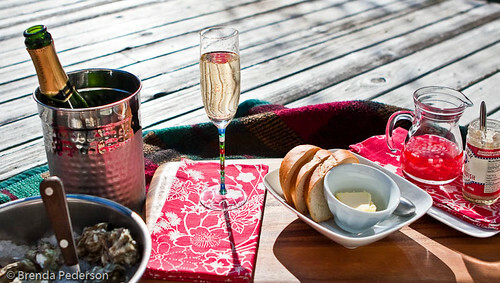 Once home I set up my picnic on the deck. Since I have yet to bring out tables and chairs I just spread an old blanket and sat with my culinary treasures on the blanket beside me. It took me a long time to come around to oysters on the half-shell. Years. But once I made the turn and started to enjoy them there was no turning back. And, living in Seattle fresh, plump oysters are available from many sources so there’s plenty of opportunity to enjoy them. Learning to shuck takes a little practice and if I haven’t shucked for some time it takes me a bit to get back to the hang of it. But it’s a great skill and once you have the satisfaction of properly wedging your knife in the hinge and feeling the little "pop" as you pry the shell open you’re motivated to keep on going. Once you get a gap in the shell you simply run your knife along the top and bottom of the shell separating the oyster from its protective cover. You want to keep the oyster as level as possible while doing this so that the "nectar" doesn’t spill out. After that you add your condiments and get to slurping! My favorite way to enjoy oysters on the half-shell is with a simple mignonette and a dash of grated horseradish (I prefer straight horseradish to horseradish sauce). There are a lot of variations on mignonette but the one below is a good, basic version. People also enjoy oysters with cocktail or tarter sauce or just a squeeze of lemon. While I’ll eat them nearly anyway I think the mignonette and horseradish allow the briny taste of the oyster to come through while adding a little interest. 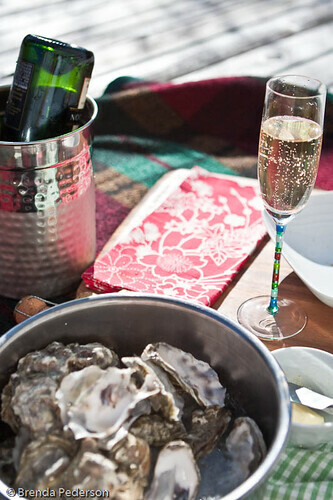 A dozen oysters, a few slices of good French bread and a glass of sparkling wine, a Pinot Gris or a crisp Sauvignon Blanc and you really don’t need anything else for a Spring picnic. This recipe makes a lot of mignonette – enough for several dozen oysters – but it will keep in the refrigerator for several weeks. The leftover could be mixed with a little oil for a vinaigrette salad dressing, too. Add the shallots, vinegar, and sugar to a small saucepan and bring to a boil. Cook uncovered for 1 minute. Remove from the heat and allow to cool to room temperature. Add the pepper. For a little more interest you may also add a tablespoon of freshly chopped herbs like dill or chives, some diced cucumber or a little grated ginger when you add the pepper. I love how you enjoy life and pamper yourself. :) And I really like the before/after photo.